Explore Brooklyn's most contested real estate development: its tangled path, ongoing construction, future plans, and the many issues raised. Proponents touted "jobs, housing, and hoops," as Brooklyn (via the basketball Nets) would regain the major league status it lost when the baseball Dodgers left for Los Angeles in 1957. But Atlantic Yards, launched in 2003, also symbolizes "the theater of land use," how questionable promises and ever-changing plans surround a knotty private-public partnership. You can't understand Atlantic Yards (in 2014 disingenuously renamed Pacific Park Brooklyn) and the Barclays Center arena unless you see the context for the 22-acre project. 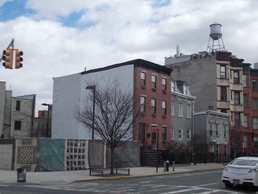 It begins at the edge of Downtown Brooklyn and extends through blocks in Prospect Heights (near Park Slope and Fort Greene) that were formerly residential and mixed-use, with industrial and commercial buildings. I'm the journalistic expert on the project, writing the daily Atlantic Yards/Pacific Park Report watchdog blog and working on a book. I've led Atlantic Yards tours for high school, college, and graduate school classes (urban studies, urban planning, New York history, architecture), visiting dignitaries from abroad, and the general public. I've written for the New York Times, Reuters, and CityLab, among others. Here's my FAQ and status report on the project. The project is being built over and beyond an 8.5-acre railyard, including a basketball arena (for the Brooklyn Nets, formerly New Jersey Nets) and 16 mostly-residential towers, up to 510 feet tall. Three streets were de-mapped. The New York Islanders hockey team arrived in 2015, though the transition has been bumpy, and the Islanders likely will leave for a new arena at Belmont Park. The project, announced in 2003, was supposed to take a decade. 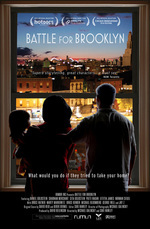 Significant public drama--including protests and counter-protests--surfaced between 2003 and 2009, captured in the documentary film Battle for Brooklyn (my review) and the documentary theater piece In the Footprint (my review). Then it was supposed to be finished by 2016. Contracts signed in 2009 allowed the project to linger to 2035. In June 2014, a new schedule accelerated the much-desired affordable housing to 2025; more quietly, the affordability standards for the next towers were relaxed. In November 2016, more delays were announced, and the project could take until 2035. The much-touted original project architect, Frank Gehry, was dropped to "value-engineer" the Barclays Center arena, designed by Ellerbe Becket (designer of Conseco Fieldhouse in Indianapolis). A pre-rusted metal "skin" and an oculus from SHoP, a buzzy New York firm, rescued a derided design. Many people love the "modernist fossil," while some hate the "George Foreman grill." Two towers at the eastern end of the project, built conventionally, were being designed by CookFox. 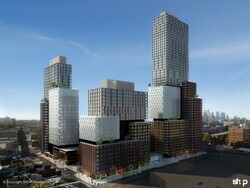 Those CookFox towers, the condo 550 Vanderbilt (B11) and the "100% affordable" 535 Carlton (B14), opened in early 2017. The affordability is debatable, given that the developer had to offer concessions to attract middle-income tenants. Two towers were announced in 2015 but delayed: 615 Dean (aka B12), designed by KPF, and 664 Pacific (aka B15), designed by Marvel Architects. They could start in 2019. The designer of B12 is unclear. Note the absence of the planned tower over the arena plaza. It's a crucial difference, as we discover, since the plaza allows for a change in scale and a place to gather. But the project likely would not have been approved without the tower. Indeed, in 2016, the developer proposed a dramatic change: shifting the bulk of the tower planned for the arena plaza across the street to Site 5, which could produce the largest tower in Brooklyn, justified by "jobs." 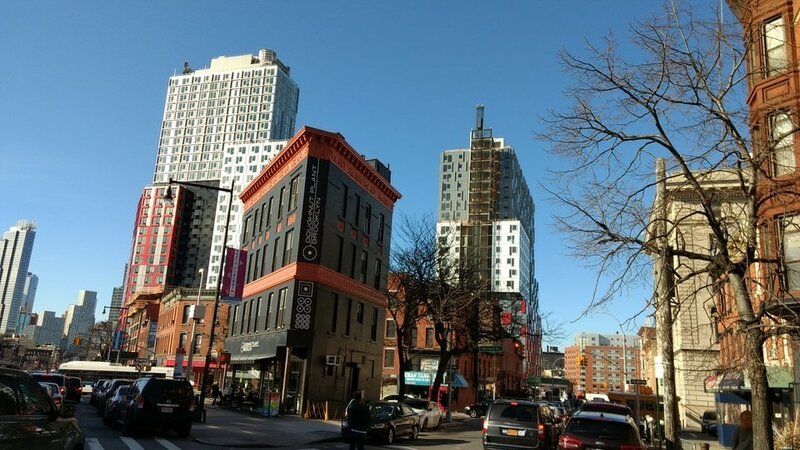 In photo at right, an April 2017 view looking northwest from Flatbush and Sixth Avenues, with 461 Dean (B2) in the left half of the frame and 38 Sixth (B3) rising in the center-right. In 2-2.5 hours, we can visit adjacent neighborhoods, including nearby Fort Greene, a Park Slope retail strip, and the new Prospect Heights Historic District, to understand the crossroads location and history of development. We'll visit the arena plaza, with a vital new subway entrance (but not the interior of the building). For information on fees, click here. the scale of the project and the role of "smart growth"
the boundaries of a "neighborhood" and whether Pacific Park Brooklyn constitutes a "new neighborhood"
In late 2013, Forest City agreed to sell 70% of the remaining project to the Greenland Group, owned by the government of Shanghai. The deal closed in June 2014 with a pledge to build the full 2,250 subsidized units, by 2025. It's unclear how that deadline will be met. In January 2018, Greenland USA bought out all but 5% of Forest City's share. Later in 2018, it sold development rights to three sites: B15 to The Brodsky Organization and B12 and B13 to TF Cornerstone. Please note: I'm clearly a skeptic regarding Atlantic Yards/Pacific Park, and my reporting backs up my contention that much in the project reflects "the Culture of Cheating." ​But my goal on a tour is enlighten, and challenge, not indoctrinate. It's fine to like the arena design/experience. I understand some think the end justifies the means. But the full story should be understood.